ALAMEDA, Calif. /California Newswire/ — The Pacific Pinball Museum is excited to announce the opening of a new art show celebrating the America's Cup Race with a collection of pinball machines and art featuring sailing and yachting: "Sailing Through Pinball." The show was curated by PPM artist and board member, Dan Fontes. "We are incredibly fortunate to be able to put together this rare collection of art with actual games from the early years of pinball," said Fontes. "Many collectors have come together to make this show possible." Since the 1930s, pinball machines, a uniquely American invention and art form, were principally manufactured in Chicago and shipped to all corners of the world. Pinball was imbued with an optimistic, vibrant energy of adventure, excitement and escapism. 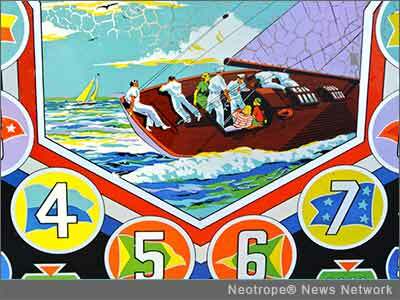 One of the more popular, yet relatively unrecognized themes that recurs in pinball art is sailing, yachting and racing boats. Sailing embodies the freedom, speed and skill of the sporty, carefree lifestyle of growing middle and upper classes. With the silk-screened art on the backglass, playfield and cabinet the standard format of pop bumpers, flippers, rollover buttons and targets were high-lighted and more appealing. Some of the pinball artists and their bosses had sailboats or yachts to navigate Lake Michigan that were the inspiration for many designs. This exhibition of sailing-related pinball art includes nine pinball machines, six back glasses and more than 30 photographs of pinball art and advertising with commentary. Beginning with early pinball in 1932, most of the exhibits date from the '30s, '40s and '50s and ends with one machine from the '80s. After its two-month run at the PPM the exhibit will be available for lease to other museums. The backglass art combines picturesque seascapes with the competitive thrill and majesty of the gorgeous ships from the 1930s through 1980s. The show offers historical, aesthetic, and informative narrative with input from noted solo sailor Bruce Schwab. With the America's Cup being held in the San Francisco Bay and teams based right here in Alameda, the show took on a personal meaning when tragedy struck. The museum houses most of their collection in a hangar across the road from Artemis, the Swedish contenders' headquarters. After seeing the team practice throughout the year, PPM staff personally felt the loss of Artemis teammate Andrew "Bart" Simpson. The tragedy inspired PPM staff to highlight this incredible sport. "The PPM wants to show support of the America's Cup Race and promote Alameda and our museum," said PPM director Michael Schiess. "This show, sprung from a tragic event, brings the fun, beauty and skill of sailing to the forefront in tribute to the America's Cup competitors." The Pacific Pinball Museum is located at 1510 Webster St. in Alameda, California. "Sailing through Pinball" is on display during regular museum hours: Tuesdays through Thursdays 2 to 9 p.m., Fridays 2 p.m. to midnight, Saturdays 11 a.m. to midnight and Sundays 11 a.m. to 9 p.m. The Pacific Pinball Museum is a 501(c)3 non-profit. For more information on "Sailing through Pinball" or the PPM, visit http://www.pacificpinball.org/ .